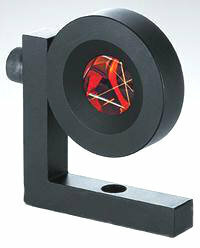 Geo monitoring and mining L-Bar Mini Prism mounted in metal holder. Supplied with L-Bar for fixed installations. The Prism offset is dependent on the mounting position. Range up to 2000 m. For price and availability please call. 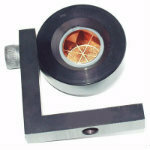 The GEO L-Bar monitoring and mining Mini Prism is intended for use with Total Station data collection systems.The L-Bar Mini Prism consists of a copper coated optical glass prism in a dust and water proof anodized aluminium housing, mounted with an 8mm hex bolt to an anodized aluminium “L” mounting bracket. This configuration allows the prism to be properly aligned with the AMTS on variable mounting surfaces. Prisms are used where X, Y & Z measurements are desired. The L-Bar Mini Prism may be mounted onto the structure or geologic feature with a standard grout in, mechanical or other user determined method. It should be installed in line of sight with the Automated Motorized Total Station system. The prism should then be rotated and positioned to be in correct alignment with the AMTS and locked into place with an 8mm hex bolt. The system can be left in place in all types of weather for permanent installations. The high quality optics requires no maintenance. Care should be taken to avoid areas where steam vapour, snow, ice, smoke, or obstructions may block the line of sight to the AMTS.